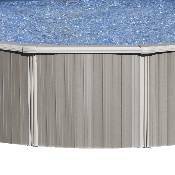 TheTrinidad LX Aluminum 52" deep all aluminum pool features a 9 inch top ledge. Aluminum provides incredible strength and pound for pound is twice as strong as steel and even stronger when compared to resin.It will not rust, corrode, age or warp and is designed to withstand semi-inground installations. It has a Sandstone frame with caramel-colored walls.